Heat oven to 375°F. In medium bowl, mix flour, granulated sugar, baking powder and cinnamon. Stir in milk and melted butter until mixture is smooth. Stir in pears and orange peel. Spread evenly in ungreased 12x8-inch (2-quart) glass baking dish. Add enough water to reserved pear liquid to measure 1 cup; heat to boiling in 1-quart saucepan. Stir in brown sugar and softened butter until melted. Pour hot sugar mixture evenly over batter. Bake 40 to 45 minutes or until top is deep golden brown. Cut into 8 squares; using spatula, place each square upside down on individual dessert plate. Serve warm with ice cream. Perfectly softened butter will still hold its shape but not melted butter. 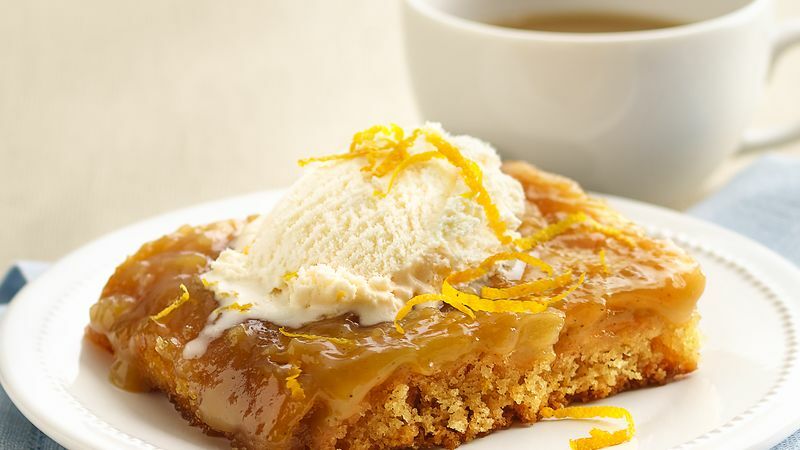 To dress up this pudding cake, garnish with pieces of orange peel.